I’ve wanted to check out Mountain West Burrito ever since they were acquired by the Heirloom Restaurant Group, who also own Communal and Pizzeria 712. Heirloom is doing such great things in the Utah dining scene, I was excited to have a little piece of Heirloom closer to home. I was thrilled to hear that they opened a new Mountain West location near Thanksgiving Point in Lehi, which is a short 10 minute drive from my home. Draper isn’t exactly what you call a food mecca, and choices for quality Mexican-American is limited. So is Mountain West my new go-to for a tasty burrito? In short, no. In fact, my trip to Mountain West this week was a lesson in blandness. Everything throughout my experience was the epitome of bland. The location is tucked in next to a Firehouse Subs. The interior space is completely unremarkable. The space is filled with long, communal tables as well as a windowside bar with stools, little to no decor, and no personality. I’m no fan of Cafe Rio’s ridiculous over-the-top decor, either, but putting a little effort into creating a more welcoming environment wouldn’t be a bad idea. If you’ve ever been to a Chipotle, Barbacoa, Cafe Rio, or the like you’ll be familiar with Mountain West’s menu. 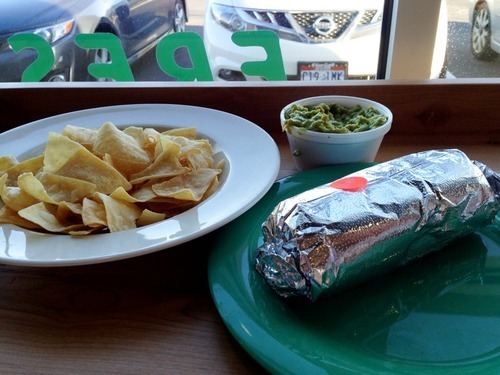 The restaurant offers a variety of burritos, tacos, nachos, and salads. The $14 price for a burrito shocked me, until I realized how large the “giant” size is. Stick with the $7 “regular” size and you’ll have plenty to eat. So, while it offers a solid selection, the menu is rather, well, bland. Service was vanilla as well. While I appreciated not being constantly yelled at military-style, which is my typical experience at places like Cafe Rio, the person working the counter didn’t seem particularly happy to see us or engage us about the food. We had numerous employees walk past us as we ate, and a little check in (“How is your food?” “Can I get you anything else?”) would have gone the extra mile and would have been appreciated. Although I certainly appreciate Mountain West’s focus on local, organic, fresh (did I miss any buzzwords?) ingredients, those things are all good as long as the food tastes good. We started with an order of chips and guacamole. The chips were fresh, crunchy, made in-house, and perfectly salted. I ate more than my fair share of these. The guacamole was a disappointment. I would have appreciated some more zip and personality. Maybe some lime juice to add some acidity and offset the creamy avocado. Or perhaps some chopped onions to add some brightness. Cilantro, cumin, cayenne…anything to add some more dimensions other than just avocado. I tried the half and half burrito. Half steak and half carnitas. The burrito come wrapped in foil and is a bit smaller (although still plenty big) than competitors’ similarly-priced burritos. They steam their tortillas, which adds a certain gumminess to the texture. The meat was tender and perfectly cooked. I had a few crunchy bits of undercooked rice, and the unremarkable guacamole made another appearance. And that’s about it for burrito fillings. In fact, I scanned the dining room looking for a fixings bar, desperate for some onions, cilantro, lime, or even some hot sauce. Nothing was in sight. I asked a dining buddy what flavors he was picking up on with his burrito. “Salt,” was his reply. I couldn’t agree more. So, all in all not a very good experience at Mountain West. I plan on visiting again and will update this post when I do. But at this point I don’t think I would recommend Mountain West. What do you think? Have you been to Mountain West? Did I just catch them on a bad day? Let me know!